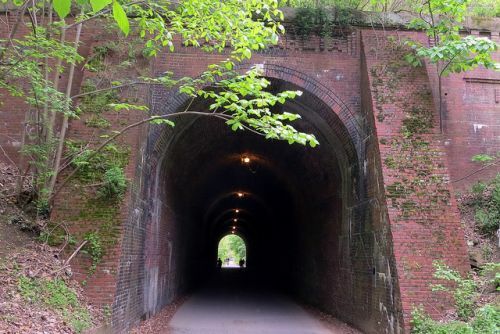 In a previous edition of the “Darcy’s Store” column, we wrote about the historic Capital Crescent Trail, well known to Bethesda residents and NW DCers alike as the suburban cycle path that winds its way from Georgetown to Rockville, MD. In this post we thought we’d zero in on the old Dalecarlia Tunnel, located just down the line from Bethesda in the Brookmont neighborhood. Built in 1910 to the carry the Georgetown Branch of the Baltimore and Ohio Railroad (now the Capital Crescent Trail) under MacArthur Boulevard and the Washington Aqueduct, Dalecarlia isn’t a particularly long tunnel but nevertheless remains an impressive feat of civil engineering that boasts decorative, Roman arch-inspired portals at either end. Similar in style to the grand railway tunnel mouths of Victorian Britain, the brick-faced Dalecarlia Tunnel measures around 340 feet in length by 18 feet wide. 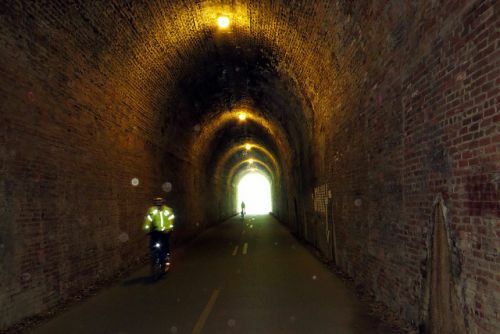 Well lit inside for the benefit of cyclists and walkers, originally accommodated a single track freight line until the B&O Railroad’s successor, CSX Transportation, closed the tunnel in 1985. Any readers recall that time and have memories of the old railroad? If so be sure to drop us a note in the comments below!